I am WAY behind in my reads. . . Lovely post. 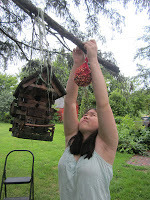 We just made a simple bird feeder for our shared garden, but we have not yet tried to make our own feed. It might be nexton our list if we can find all ingredients here in Kenya. Great idea! nature must be preserved as soon as possible. invent new tools and equipment. This is our life. I work in http://www.aquar-system.com/ and we have long been interested in the topic, and try. what would our development primarily supported the natural balance.